Tennis can be a very competitive sport. For you to become World No. 1, you have to practice a lot. Practicing in tennis can be with a coach or a hitting partner. If ball boys are not around, picking up used balls can be an exhausting task. Luckily, I found Kollectaball. I tried one of their flagship products, the Kollectaball KMax 60. Kollectaball KMax 60, the chief and most versatile ball collector, is easy and fun to use. 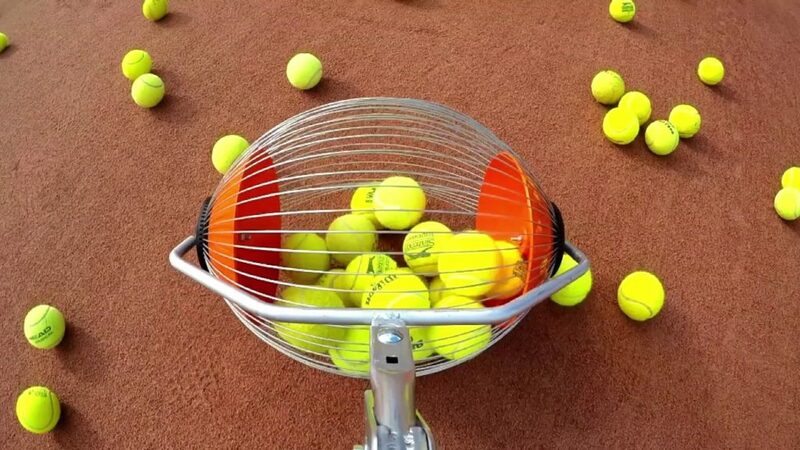 This Kollectaball can hold up to 60 tennis balls and can easily dumped into a ball feeder. The handle comes with a convenient hook so that it can be stored on the court fence and out of the way. As for my personal experience, I find it very stress-free to use. I would suggest for you to don’t maximize picking up 60 balls. I think up to 50-55 balls so you can empty it easier. Although, 60 balls still fits. It’s just easier to unload with less balls. It’s very durable and easy to pack up. An interchangeable cage is sold separately for extra storage. Take note that each item is packed in a flat cardboard box (including tools) and needs assembly. There are instructions / manual inside each box. Alternatively, you can watch the video instructions online. I would definitely recommend this product. It makes collecting tennis balls more fun! In few seconds, you can collect the balls without picking it by hand. It is also durable and easier to clean. The wires are also easy to replace but as per the manufacturer, it can collect and be durable for over 10,000 hours. This is a product worth investing in if you’re a serious tennis player! That looks like a really convenient way to collect all your balls while practicing. I have a friend who would love this. What a neat gadget and one that won’t strain your back by having to bend down! What a convenient and easy way to collect tennis balls. Such a handy little gadget to have so you can spend more time on your talent and less time chasing down balls. This device is great to have. Saves a lot of back stress in picking up the balls. I guess most of the tennis clubs already have this. Kollectaball seems to be a very practical and useful piece of equipment. It seems like every tennis player and tennis caddy’s dream. Nice! I wish Kollectaball was invented around the time I was playing tennis when I was a child! LOL! Oh wow. This is going to make picking up tennis balls a whole lot easier. No more back breaking bending required! How cool! What a smart device that also looks sanity saving! I’m over here wishfully thinking about all the other things that I want it to work on (legos, kids socks, etc. :)!). In university, my best friend was a tennis coach (and so was her boyfriend) — they actually used this product on the court! There are so many courts around here that should be using these! Looks like kollectaball makes it a snap to gather up all those tennis balls quickly and with less strain on the back. What a handy idea! Would be great for those owners of tennis ball obsessed golden retrievers. What a handy gadget for tennis players to have. I know a few people that would love this. Wow, I had no idea such a cool invention existed! Now it makes sense how professionals get it done!! It is such a great product.So convenient for players & would save too. Whoever invented this is literally a genius! That is really handy!! I seriously need to get one! I used to use a similar tool to pick up walnuts. It works SO well and definitely saves your back. What an interesting gadget! We could use this at our local tennis court. It would come in handy. I wish I had this growing up when I tried to play tennis. Man it was a headache this is a genius product! I would love to try the Kollectaball KMax 60. It seems so fun!